This stuffed blue crabs recipe consists of crab meat, eggs and spices then deep fried. This recipe is easy too, just mixing all the ingredients to create the stuffing and then deep fry the crabs. The only tedious part is removing the crab meat from its shell. Just to give you some info about the blue crabs, those crabs are the common varieties we often see in the wet market. It is called “alimasag” which is not to be confused with “alimango” which is the mud crab. But you can use mud crabs as an alternative to blue crabs if that is your preference. I also have a rellenong alimango recipe if you like to cook it after you have tried this rellenong alimasag. 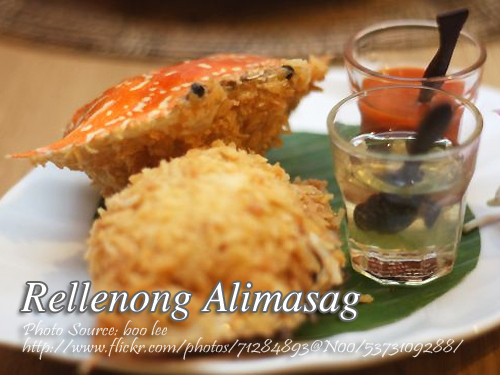 To cook rellenong alimasag; Remove meat of the cooked crab. Fry the potatoes and set aside. Saute garlic and onions. When tender, add tomatoes and sweet pepper. Continue cooking. Then, add the crab meat, raisins and potatoes, salt, MSG, and pepper to taste. Clean each crab shell and moisten it with little beaten eggs. Fill each crab shell with crab meat mixture and pack firmly. Dust top with bread crumbs and dip in beaten eggs. Fry top side down in hot oil. Remove meat of the cooked crab. Fry the potatoes and set aside. Saute garlic and onions. When tender, add tomatoes and sweet pepper. Continue cooking. Then, add the crab meat, raisins and potatoes, salt, MSG, and pepper to taste. Clean each crab shell and moisten it with little beaten eggs. Fill each crab shell with crab meat mixture and pack firmly. Dust top with bread crumbs and dip in beaten eggs. Fry top side down in hot oil. Serve hot. Good for 8 person.